The "Keyframes" panel is where you make new keyframes for the animation. These will show up in the Timetrack dialog. To jump to a specific keyframe, double click on the "(JMP)" column. The Add keyframe button adds a new keyframe to the current frame - a frame where there is no keyframe set already. Remove keyframe removes a keyframe. The Duplicate keyframe button copies the keyframe to the current frame. 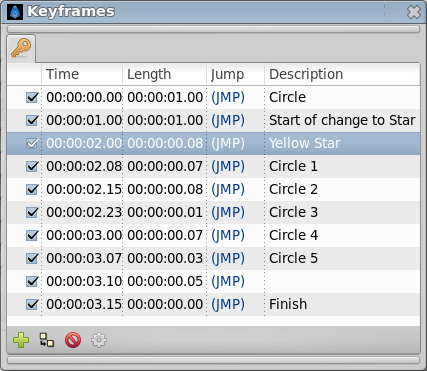 The Keyframe Properties button display the Keyframe Dialog of the selected keyframe. Don't forget to set the "Description" of your keyframes, this description will be displayed in the upper left corner of the canvas window. Right click in keyframe list open the keyframe contextual menu for the selected keyframe. Place the time cursor at a frame where there isn't currently any keyframe. Then press the "Add new Keyframe" button. If you place the time cursor at a frame where there is currently an existing keyframe or if animation Start Time egals animation End Time (animation Duration is 0m 0s 1f) then the "Add new Keyframe" button is disabled. Once you press the button then a new entry is added to the list of keyframes and a vertical dashed line is added in the time line. No waypoint is created. If there is a waypoint at the original keyframe then the waypoint is duplicated. Its duplication includes the parameter value and its interpolation types. There is no waypoint for that parameter at ANY frame in the time line: Then NO waypoint is created. If there is a waypoint in the time line for that parameter, but not in the keyframe that is going to be duplicated, then in the duplicated keyframe is created a new waypoint with a value for the parameter of the result of the current value at the original keyframe and a "TCB Smooth" interpolation type for both "In" and "Out". Of course, duplicate a keyframe will produce a new keyframe at the place pointed by the time cursor and will add a new one to the keyframe list in the proper place. In the keyframe list, the new added keyframe have the same description than the original, plus a "(Duplicate)" at the end. Just select a keyframe from the keyframe list and press the Remove keyframe button. It will remove the keyframe and all the waypoints for all parameters for all layers that are currently there. NOTE: If you move a keyframe by modifying its time in the keyframe list dialog and immediately press the Remove Keyframe button then the waypoints are not deleted. It seems to be a bug but also can be considered a feature if you really want to keep the waypoints and not the keyframe. This page was last modified on 4 October 2015, at 11:01.